living, work, hobbies; what one person does for a living or how they pass the day is always interesting to me. But then again, if you had asked me what I would be doing in five years, I would not have said making cheese and chutneys and running a cheese manufacture and wholesale business. Today I was at work alone, first time I can remember in a long time. First thing was to make some trial chutneys. We had bought a box of pineapple from our greengrocer wholesalers, so I set about prepping it, cutting into small pieces and thought about a recipe. I found some pieces of some root ginger from our marathon chutney making session last week which gave me an idea. Penny Pig and Snouter will get the tough pineapple outsides, I can just hear them salivating at the thought of it. Yum! 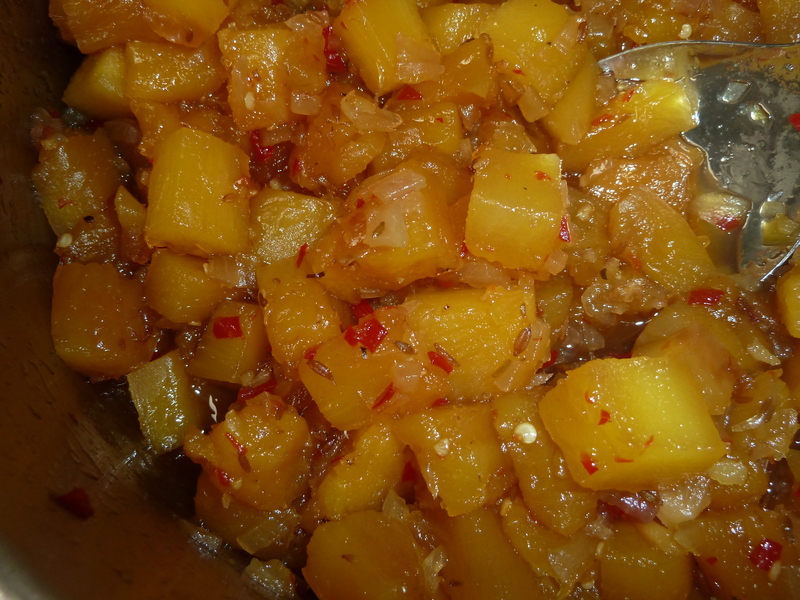 The majority of our chutney recipes are made up and today I decided to make two trial pineapple chutneys. Our chutneys sell really well in the shop and to our wholesale customers and account for quite a chunk of shop takings, which is great. 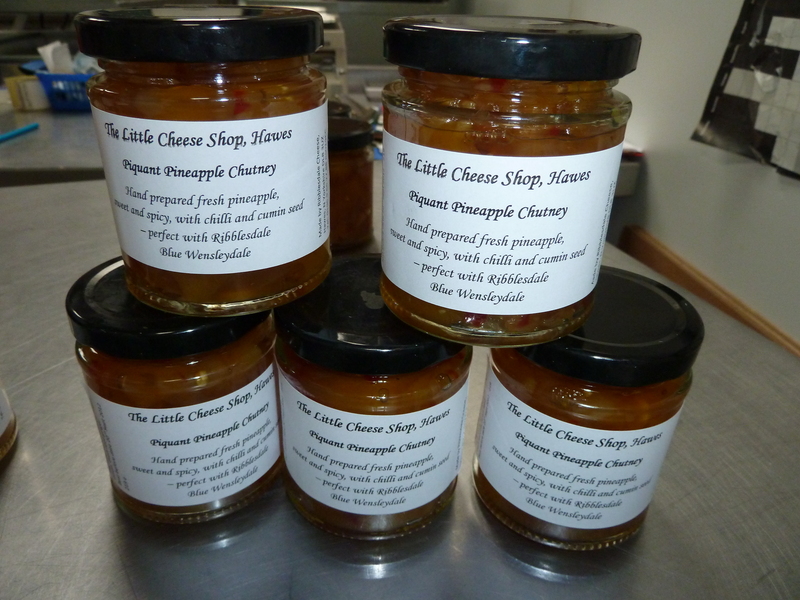 Our Wensleydale with ginger, in fact, anything with ginger is really popular in the shop, so I thought that a pineapple and ginger chutney felt like a good combination. For the second one, and I know Lydia and Stu will cringe when they get back, I thought I would make it spicy. It is well known that I put chilli in pretty much everything I make, and halve the amount of sugar or even less and yes, today, was no exception. In my former existence, which seems aeons ago, I was once taken to Nobu and had what was described on the menu as carpaccio of pineapple. Ok, might sound pretentious, but it was finely sliced pineapple, slightly chargrilled with slivers of chilli with it and was fabulous. As a result of this experience, the second trial batch turned into pineapple with chilli and a mystery ingredient to give it a bit of oomph. Have to say, even though I am biased, they were both lovely, cos I got to lick out the pan (with no one around to tell me off) after potting them all up. I only made 9 jars of each and they will go on sale in the shop as of tomorrow. The Pineapple and Ginger will go perfectly with our award winning Old Tyme Wensleydale and the Pineapple with Chilli will go well with our Blue Wensleydale. were stolen, so our efforts were no longer available. 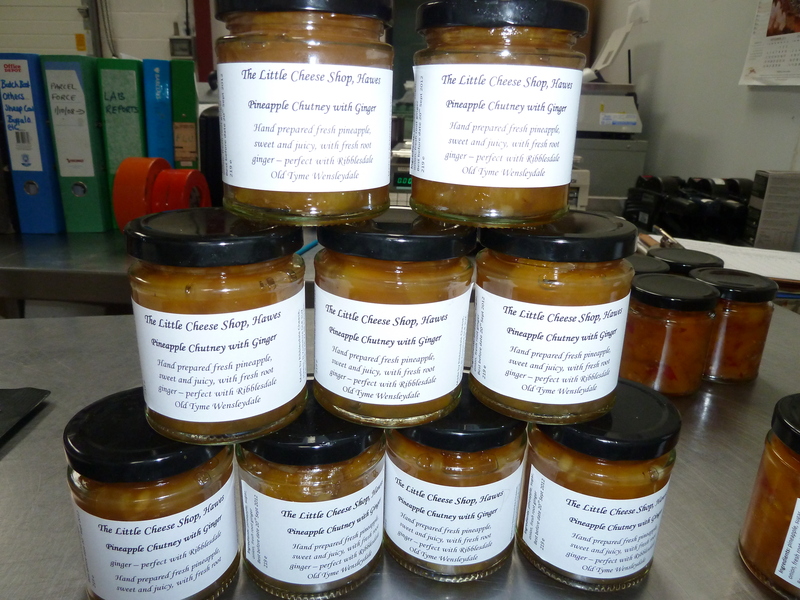 I wanted to make a longer label than our usual ones so that we could include some tasting information: which of our cheese the chutney would best go with. As we had to replace the laptops, we also upgraded Word from 2003 to 2010. I don’t know if anyon else has a problem re-learning something that has changed very little over the past 20 years, or at least, in small increments that were easy to grasp, but to plunge straight into 2010 has been a nightmare – it is SO different. To cut a long story short, I could not find the right template in Word for my new label design, so I ended up creating one. Maybe not such a good idea, but once committed, thought I’d better get on with it. 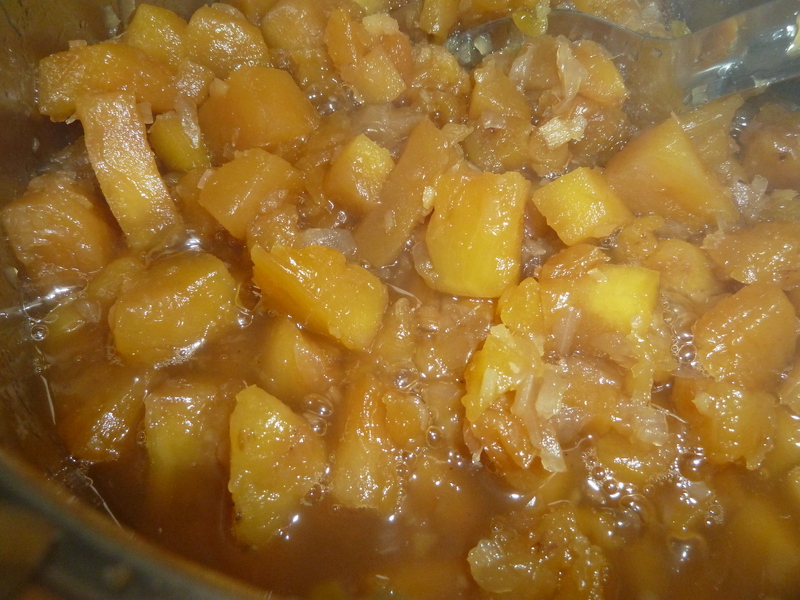 Today, I made two trial batches of pineapple chutney, designed new labels, took some orders for dispatch tomorrow, had a coffee and chocolate cookie with our landlord, with whom it is always nice to chin wag: we discussed the current Greece crisis and concluded it was pretty damned serious. Then took some orders for dispatch tomorrow, chased a few customers for late payment, spoke with Julian who is about to open Merritts of York on Friday 24th September who also ordered some cheese, (good luck, Julian!) organised the delivery of new weight ticket labels, discovered a pallet was not picked up, destined for a customer, that should have been picked up and had a quick coffee with Lydia who had popped by on her day off, after having a new washer delivered, with the latest addition to her family: Rich, fish and Little Ted. He is the most beautiful, tiny, totally adorable, soft bellied, fluffy little puppy dog. Photos to follow.